This product combines the strengths of OmniBlue and FertiCoat into one convenient product. 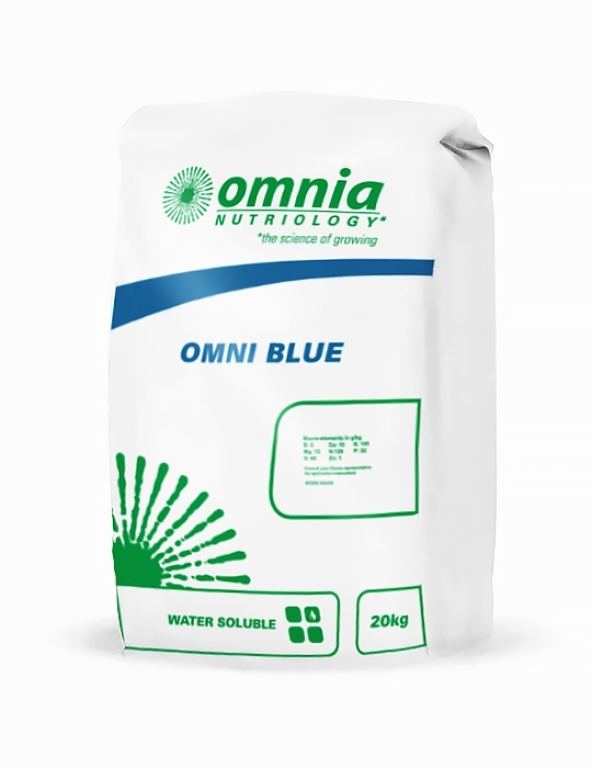 OmniBlue contains the ideal 1:1 ratio of potassium and nitrogen for plant production. It is also enriched with a range of trace elements that are generally low in Australian soils. OmniBlue is ideal for use in vegetable and row crops, also orchard crops and vineyards. OmniBlue can be coated with FertiCoat, Omnia’s advanced coating system, optimising nutrient availability. This system offers the added benefits of kelp and humates giving early root stimulation and minimising leaching through natural chelation. FertiCoat has proven efficacy in improving crop production through improving fertilizer efficiency. Coated onto solid fertilizer, FertiCoat acts to protect applied elements from lockup in the soil, particularly phosphate. If applied to spread urea, FertiCoat could reduce the level of leaching, improving the level of available nitrogen to the crop. FertiCoat significantly reduces the risk of leaf scorch commonly experienced with foliar applications of UAN. This allows potentially higher rates of UAN application and increases in-crop nitrogen application options, while improving crop uptake and yield potential. FertiCoat can also be mixed with UAN for application at planting. See label for application information.